Alzheimer’s disease Advax(CpG)- adjuvanted MultiTEP-based dual and single vaccines induce high-titer antibodies against various forms of tau and Aβ pathological molecules | Capo Therapeutics, Inc. Although β-amyloid (Aβ) may be the primary driver of Alzheimer’s disease (AD) pathology, accumulation of pathological tau correlates with dementia in AD patients. Thus, the prevention/inhibition of AD may require vaccine/s targeting Aβ and tau simultaneously or sequentially. Since high antibody titers are required for AD vaccine e cacy, we have decided to generate vaccines, targeting Aβ (AV-1959R), Tau (AV-1980R) or Aβ/tau (AV-1953R) B cell epitopes, based on immunogenic MultiTEP platform and evaluate the immunogenicity of these vaccines formulated with AdvaxCpG, delta inulin, Alhydrogel®, Montanide-ISA51, Montanide-ISA720, MPLA-SM pharmaceutical grade adjuvants. Formulation of AV- 1959R in AdvaxCpG induced the highest cellular and humoral immune responses in mice. The dual-epitope vaccine, AV-1953R, or the combination of AV-1959R and AV-1980R vaccines formulated with AdvaxCpG induced robust antibody responses against various forms of both, Aβ and tau pathological molecules. While anti-Aβ antibody titers after AV-1953R immunization were similar to that in mice vaccinated with AV-1959R or AV-1959R/AV-1980R combination, anti-tau titers were signi cantly lower after AV-1953R injection when compared to the AV-1980R or AV-1959R/AV-1980R. In silico 3D-modeling provided insight into the di erences in immunogenicity of these vaccine constructs. In sum, AV-1959R and AV-1980R formulated with AdvaxCpG adjuvant were identi ed as promising immunogenic vaccines for ongoing pre- clinical assessment and future human clinical trials. Aβ-mediated plaque formation is thought to be the primary event in Alzheimer’s disease (AD) pathogenesis1,2,3. Later, AD pathology becomes self-propagating4,5,6,7 with less dependence on Aβ and greater involvement of other proteins such as tau8. The temporal relationship of misfolded proteins in AD pathogenesis may have relevance to AD vaccine strategies. Hence, vaccines targeting Aβ only may be effective prior to or in the very early stages of AD pathogenesis, whereas vaccines targeting tau may remain effective in latter stages of AD. Therefore, the most effective strategy may be to develop an immunogenic vaccine or vaccines targeting both Aβ and tau, such that the same vaccine or the combination of vaccines would then be effective across the entire spectra of AD progression. Safety is an important consideration in AD vaccine development given cases of aseptic meningoencephalitis observed previously in the AN-1792 clinical trials and likely associated with autoreactive T cell infiltration into the brains of vaccinated subjects9. To avoid this risk, we have developed the MultiTEP vaccine platform that consists of a string of 12 non-self, pathogen-derived T helper (Th) epitopes10, to which we can attach different B cell self-epitopes from neuronal proteins involved in AD pathogenesis. Previously we have demonstrated that a DNA vaccine composed of three copies of a B cell epitope from the N-terminal region of Aβ (Aβ1-11) attached to the MultiTEP protein (AV-1959D) was highly immunogenic in mice10,11, rabbits12 and macaques10,13. To develop a vaccine targeting pathological tau we decided to use the same immunogenic MultiTEP platform incorporating the tau2-18 epitope. We chose this epitope because it was previously shown that tau2-18 is normally hidden in microtubule bound tau conformation but becomes highly exposed during tau aggregation14,15. Importantly, this region of tau, also termed the phosphatase-activating domain (PAD), plays an important role in activation of a signaling cascade involving PP1 and GSK-3 that leads to dissociation of cargo from kinesins and therefore anterograde fast axonal transport (FAT) inhibition. The exposure of PAD that is required for inhibition of FAT might be regulated by PAD phosphorylation, as well as by the N-terminal truncation of tau that occurs during neurofibrillary tangle formation. Phosphorylation of Y18 as well as truncation of the N-terminal region of aggregated tau has been suggested to remove the toxic region and have a protective role14,15,16,17. Thus, we hypothesized that anti-tau2-18 antibodies will preferentially recognize pathological rather than normal forms of tau, and thereby prevent its aggregation and PAD mediated toxicity during the early stages of tauopathy. Here we describe for the first time the generation of MutiTEP platform-based recombinant vaccines targeting Aβ1-11, (AV-1959R), tau2-18 (AV-1980R), or tau2-18 and Aβ1-11 simultaneously (dual specificity, AV-1953R) and report on the immunogenicity of these vaccines. We also identify a novel adjuvant, AdvaxCpG derived from delta inulin18, that provides optimal immune enhancement for the MutiTEP vaccines. Data from previous clinical trials showed that high anti-Aβ antibody titers correlated with a reduction in brain pathology in AN-1792 immunized AD patients that later came to autopsy, suggesting that therapeutic benefit was closely linked to antibody titers9. The cGMP grade delta inulin-based adjuvants, Advax™ and AdvaxCpG were previously reported to enhance the immunogenicity and efficacy of various vaccines targeting viral and bacterial antigens in pre-clinical studies18,19,20,21,22 and clinical trials23,24. To select an adjuvant that will induce the highest antibody response and lowest variability of antibody levels in response to vaccinations of mice with AV-1959R, we tested these adjuvants in parallel with Quil-A25, a less purified version of QS21, the adjuvant that was used in the AN-1792 clinical trials9 as well as the commercial adjuvants Alhydrogel®, Montanide-ISA51, Montanide-ISA720, and MPLA-SM. The results showed that AV-1959R formulated with AdvaxCpG induced significantly stronger antibody responses than all the other adjuvants with a low variability in responses between animals in the AdvaxCpG group (Fig. 1a). 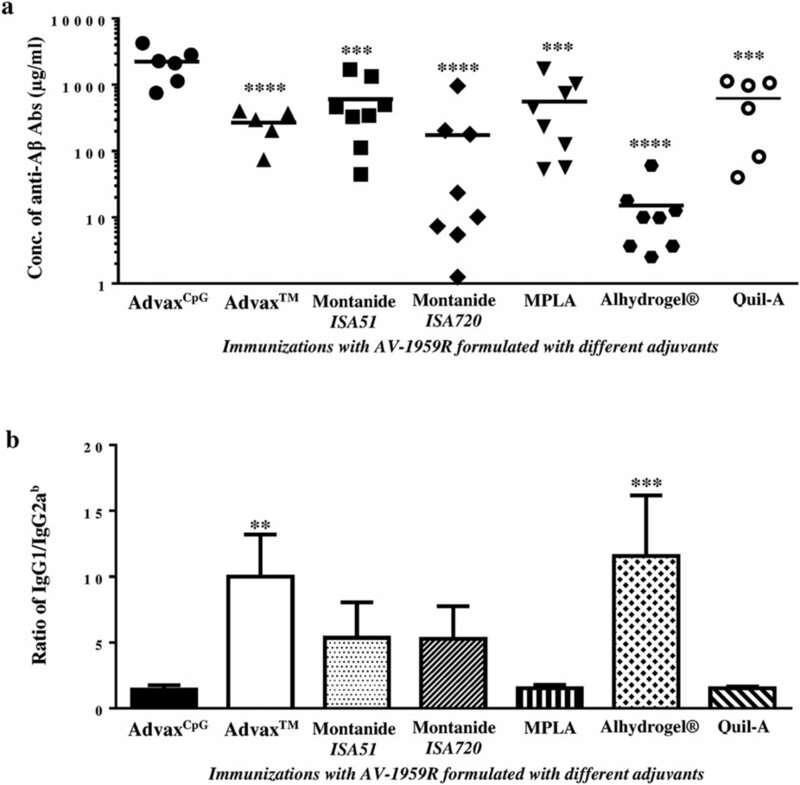 Analysis of antibody isotypes specific for Aβ showed that Alhydrogel®, AdvaxTM, Montanide-ISA51 and –ISA720 adjuvants induced primarily an IgG1 (Th2) response, whereas AdvaxCpG, MPLA and Quil-A shifted the response toward IgG2ab, a Th1 response associated isotype (Figs 1b and S1). To further explore adjuvant effects on Th1 and Th2 phenotype, we measured the numbers of splenocytes producing IFN-γ and IL-4 cytokines by ELISpot (spot-forming cells, SFC) and found that the AdvaxCpG group produced significantly higher frequencies of IFN-γ+ and IL-4+ Th cells than the other adjuvant groups (Fig. 2a,b). The TLR4 agonist, MPLA was the only other GMP-grade adjuvant that generated significant numbers of both IFN-γ+ and IL-4+ Th cells, although these were approximately 5 and 1.5 times, respectively, lower than those induced with AdvaxCpG (Fig. 2a,b). Calculation of the ratio of IL-4/IFN-γ positive Th cells (Fig. 2c) supported the antibody isotypes data and confirmed that AdvaxCpG was the strongest combined Th1 and Th2 adjuvant followed by MPLA, while other adjuvants only generated primarily Th2 responses to immunizations with AV-1959R. The level of Th1 responses induced by the control adjuvant, Quil-A were comparable to MPLA, but significantly lower than in AdvaxCpG (Figs 1 and 2). Finally, AdvaxCpG was also well tolerated by all animals with no evidence of either local or systemic vaccine adverse reactions. On the basis of these data, AdvaxCpG was selected as the sole adjuvant for all subsequent studies with MultiTEP-based AD vaccines targeting Aβ, tau, or Aβ/tau simultaneously or sequentially. 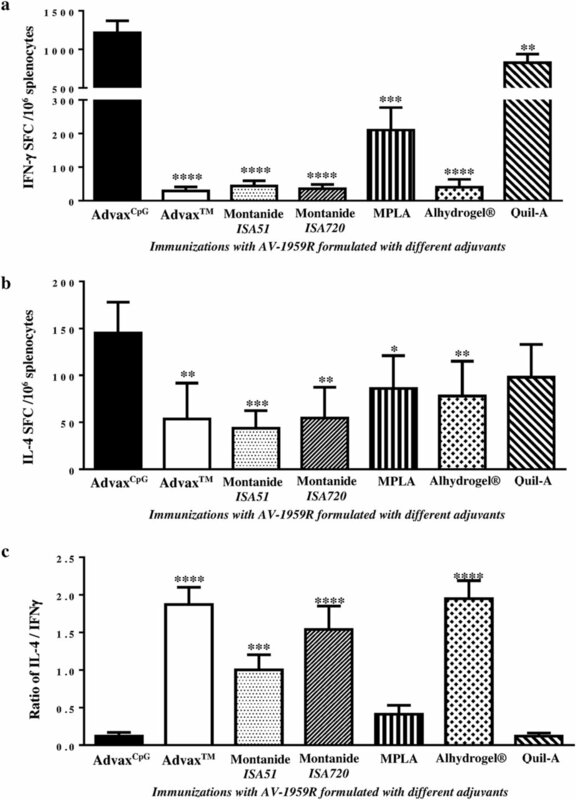 Figure 1: Humoral immune responses in mice vaccinated with AV-1959R protein formulated with cGMP grade adjuvants (AdvaxCpG, AdvaxTM, Montanide-ISA51, Montanide-ISA720, MPLA, Alhydrogel®) and control adjuvant, Quil-A. (a) Concentrations of anti-Aβ antibodies were measured by ELISA in sera collected after the 3rd immunization. Lines represent mean values. (b) Isotypes of generated anti-Aβ antibodies had been determined by ELISA (see Fig. S1) and IgG1/IgG2ab ratio was calculated. Bars represent average ± SD (n = 6–8/per group). Statistical significance was calculated against group of mice immunized with AV-1959R formulated in AdvaxCpG using ANOVA test (**P < 0.01***P < 0.001 and ****P < 0.0001). Figure 2: Cellular immune responses in mice vaccinated with AV-1959R protein formulated with cGMP grade adjuvants (AdvaxCpG, AdvaxTM, Montanide-ISA51, Montanide-ISA720, MPLA, Alhydrogel®) and control adjuvant, Quil-A. (a,b) Numbers of IFN-γ (a) and IL-4 (b) producing T cells were calculated by ELISpot in splenocyte cultures obtained from experimental and control animals. (c) IL-4/IFN-γ ratios were calculated based on data presented in (a,b). Bars represent average ± SD (n = 6–8/per group). Statistical significances were calculated against group of mice immunized with AV-1959R formulated in AdvaxCpG using ANOVA test (*P < 0.05, **P < 0.01, ***P < 0.001 and ****P < 0.0001). All tested AD vaccines formulated with AdvaxCpG adjuvant generated equally strong T cell responses, measured by detection of IFN-γ+, IL4+ SFC or splenocytes proliferation specific to foreign Th cell epitopes incorporated in the MultiTEP platform (Fig. 3). Of note, no potentially harmful autoreactive Th cells were detected after re-stimulation of immune splenocytes with Aβ or tau self-epitopes, either by ELISpot or splenocytes proliferation assay (data not shown). Importantly, generation of strong cellular immune responses to Th epitopes incorporated in the MultiTEP vaccine platform supported the production of equally high concentrations of anti-Aβ antibodies in mice vaccinated with AV1959R/AV-1980R combination, AV-1959R, or AV-1953R. As expected, immunization with AV-1980R did not generate anti-Aβ antibodies (Fig. 4a). 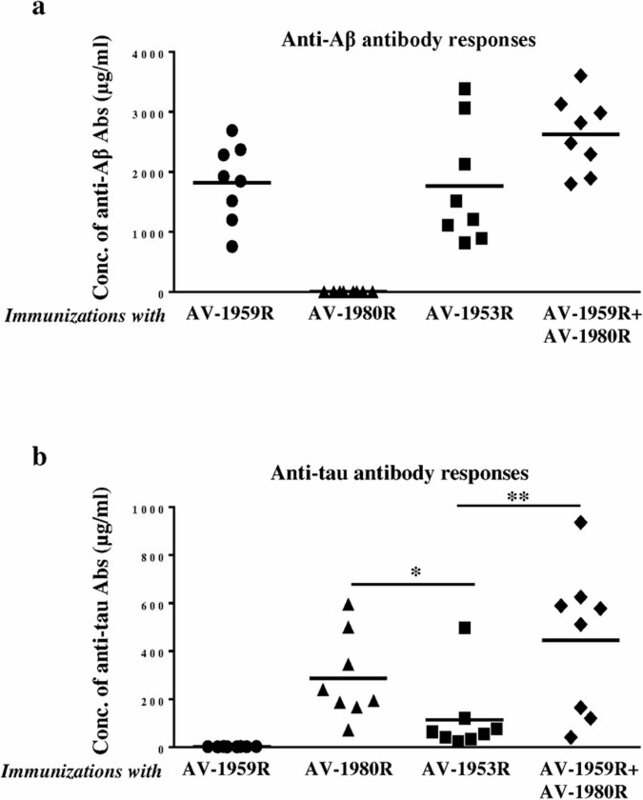 It should be mentioned that concentrations of anti-tau antibodies were significantly lower in mice immunized with AV-1953R compared to mice vaccinated with the AV-1959R/AV-1980R combination or AV-1980R alone (Fig. 4b). These antibody response patterns were mirrored by the frequency of antibody secreting B cells (ASC); numbers of anti-Aβ ASC were similar in mice immunized with single or combined vaccine formulations, while the numbers of anti-tau ASC were significantly lower in mice vaccinated with the dual-epitope AV-1953R vaccine (Fig. 5). Figure 3: Cellular immune responses in mice immunized with epitope vaccines targeting Aβ (AV-1959R), tau (AV-1980R), and Aβ/tau (dual-epitope vaccine: AV-1953R or mixture of AV-1959R and AV-1980R). Numbers of IFN-γ (a) and IL-4 (b) producing T cells were calculated by ELISpot in splenocyte cultures obtained from experimental and control animals. (c) Proliferation of cells was detected by [3H]-thymidine incorporation assay in the same splenocyte cultures and expressed as stimulation index. Cellular immune responses in control group were at the background level (INF-γ+ and IL-4+ SFCs were <15, and stimulation index was <1.6). Bars represent average ± SD (n = 8 per group). Figure 4: Humoral immune responses in mice vaccinated with AV-1959R, AV-1980R, AV-1953R and mixture of AV-1959R and AV-1980R formulated with AdvaxCpG adjuvant. Concentrations of anti-Aβ (a) and anti-tau (b) antibodies were measured by ELISA in sera collected after the 3rd immunization and calculated using calibration curves generated with 6E10 and 1C9 monoclonal antibodies, respectively. Lines represent mean values for n = 8/per group (*P < 0.05, **P < 0.01, ANOVA test). Figure 5: Number of B cells producing anti-Aβ and anti-Tau antibodies in mice vaccinated with AV-1959R, AV-1980R, AV-1953R and mixture of AV-1959R and AV-1980R formulated with AdvaxCpG adjuvant. Detection of anti-Aβ (a) and anti-tau (b) antibody-secreting cells (ASC), visualized as spots, was done in splenocyte cultures obtained from experimental and control mice using ELISpot assay. Bars represent average ± SD (n = 8/per group, *P < 0.05, ANOVA test). We hypothesized that anti-tau B cell epitopes attached to MultiTEP may not be well presented on the surface of the dual-epitope AV-1953R vaccine compared with the single epitope constructs. To address this possibility we undertook in silico structural modeling of the MultiTEP platform-based AV-1980R, AV-1959R and AV-1953R vaccines to examine the surface accessibility of B cell antigenic determinants of Aβ1-11 (EFRH)26 in AV-1959R and AV-1953R and Tau2-18 (PRQEF; paper in preparation) in AV1980R and AV-1953R (Fig. 6). The modeling data suggested that on AV-1980R, two of three tau epitopes are linear with the side chains of the critical amino acid residues accessible on the surface (Fig. 6a,d), while in AV-1959R, all three Aβ epitopes are linear with the side chains of the critical amino acid residues accessible on the surface (Fig. 6b,e). On AV-1953R, two out of three Aβ and two out of three tau epitopes are linear, however, only side chains of Aβ, but not critical tau amino acid residues are easily accessible (Fig. 6c,f). Hence, changes in the epitope structure in combination with alterations in the side chain accessibility of critical residues in the epitopes may have led to the reduced anti-tau immunogenicity of the AV-1953R dual-epitope construct. 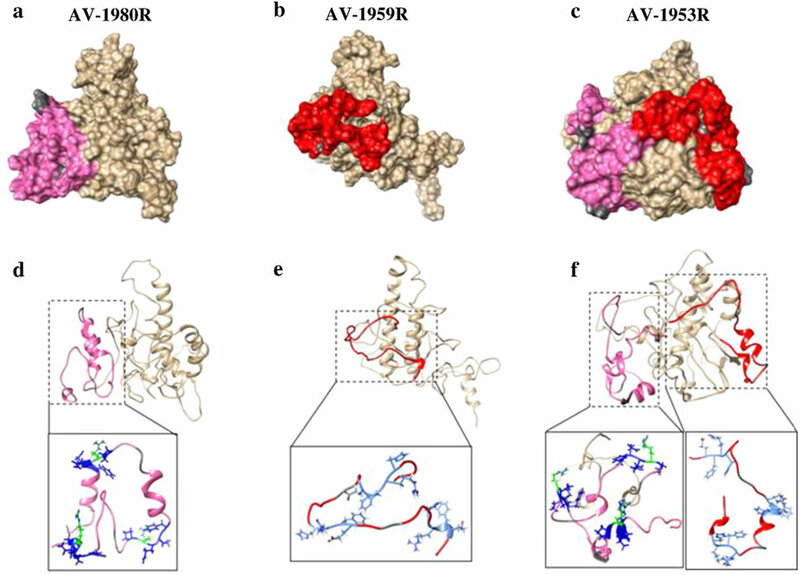 Figure 6: 3D structural models of AV-1980R, AV-1959R and AV-1953R synthetic proteins. The surface filled representations of the AV-1980R (a), AV-1959R (b) and AV1953R (c) are presented in the upper panel. Tau and Aβ epitopes on the MultiTEP protein are highlighted in pink and red, respectively. The GS linker is highlighted in dark grey. In the lower panel, critical residues on the AV-1980R epitope (PRQEF) are highlighted in blue (d) and the critical residues on the AV-1959R epitope (EFRH) are highlighted in cyan (e). In AV-1953R critical residues on each epitope follows AV-1980R and AV-1959R color cording (f). To demonstrate the effectiveness of antibodies generated in mice immunized with single vaccines, AV-1959R or AV-1980R, the mixture of two vaccines (AV-1959R/AV-1980R) or dual vaccine (AV-1953R), we analyzed the binding of immune sera to various pathological forms of Aβ and Tau in brain tissues from four different AD cases by Western Blot (WB) (Fig. 7a,b) and immunohistochemistry (IHC) (Fig. 7c). Figure 7: Immune sera isolated from mice vaccinated with AV-1959R, AV-1980R, AV-1953R and mixture of AV-1959R and AV-1980R formulated with AdvaxCpG adjuvant bound to different forms of Aβ and tau in the brains from AD cases. Western blots of soluble (a) and insoluble fractions (b) of brain homogenates containing 50 μg total protein from four AD cases were stained with immune sera normalized to 1 μg/ml for anti-Aβ and 0.4 μg/ml for anti-tau antibodies based on ELISA data. (c) Immune sera were screened for the ability to bind to human Aβ plaques or/and tau tangles using 40 μm brain sections of formalin-fixed cortical tissue from the same AD cases. The original magnification is 60× and the scale bar is 20 μm. The AV-1959R-immune sera bound monomeric Aβ in soluble as well as low and high molecular weight oligomers in both soluble and insoluble fractions of brain homogenates. As expected, AV-1980R-immune sera recognized monomeric tau as well as multiple larger and smaller species of tau in both soluble and insoluble fractions of brain homogenates. What is more important, antibodies generated by either the mixture of vaccines (AV-1959R/AV-1980R) or the dual vaccine (AV-1953R) recognized the same species of Aβ and tau that were detected by antisera isolated from mice vaccinated with appropriate single vaccines (AV-1959R and AV-1980R). Similar results have been obtained by IHC analyses of the same brain tissues (Fig. 7c). AV-1959R-immune sera bound senile plaques only, AV-1980R-immunie sera bound NFTs and neuritic threads, yet sera from mice immunized with AV-1959R/AV-1980R mixture or AV-1953R bound both pathologies: plaques, neuritic threads and NFTs. Therefore, both mixture of MultiTEP-platform based vaccines and the dual vaccine could be an effective active immunotherapeutic strategy for targeting both misfolded proteins involved in AD pathology. All the above vaccines are based on our universal MultiTEP vaccine platform that is based on a string of Th foreign epitopes which, as shown in monkeys, can stimulate immune responses in a broad population of subjects with high MHC class II gene polymorphisms10. Notably, the universal MultiTEP platform may allow using two vaccines targeting Aβ and tau at early and late stages of the disease, respectively. At the initiation of anti-tau immunotherapy AD patient immunized previously with anti-Aβ vaccine would have large numbers of MultiTEP-specific memory Th cells and hence will rapidly generate therapeutic concentrations of antibodies. To simulate this situation, we immunized mice with AV-1959R formulated in AdvaxCpG or injected with AdvaxCpG only (control) and both groups were boosted with vaccine targeting tau B cell epitope, AV-1980R. Boosting of AV-1959R vaccinated mice with AV-1980R, but not sham-injected mice, induced significantly higher cellular (Fig. 8a) and humoral (Fig. 8b) immune responses, thus proving the synergistic effect of sequential immunization with different MultiTEP vaccines. 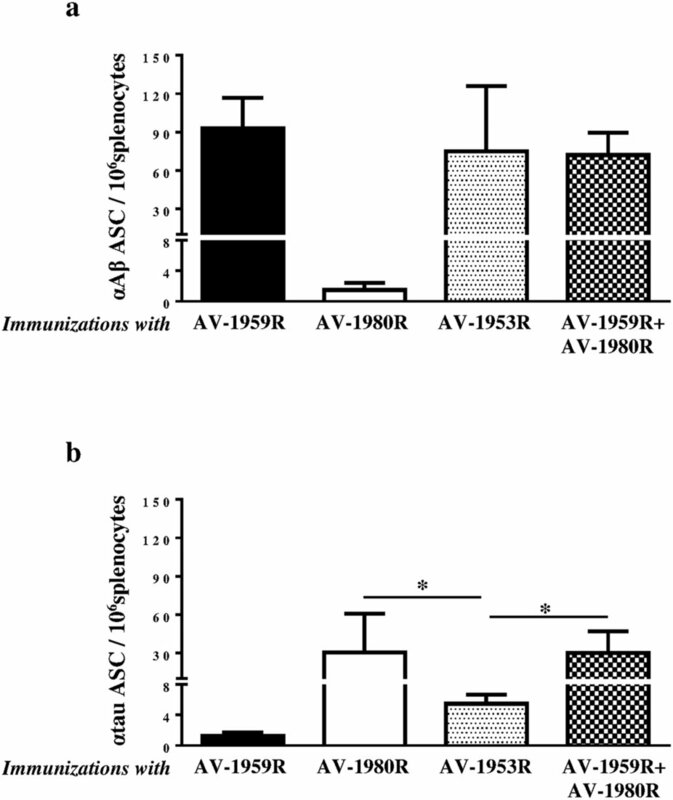 Figure 8: Humoral and cellular immune responses in mice vaccinated twice with AV-1959R and boosted (single boost) with AV-1980R formulated with AdvaxCpG adjuvant. (a) Numbers of IFN-γ producing cells were detected by ELISpot in splenocyte cultures. Bars represent average ± SD for n = 4/per group. (b) Concentrations of anti-tau antibodies were measured by ELISA. Lines represent mean values for n = 10/per group (*P < 0.05, **P < 0.01, t-test). AD is the most common cause of dementia, and worldwide nearly 46 million people have Alzheimer’s or related dementias and this number is estimated to increase to 131.5 million by 205027. Currently, the majority of neuroscientists agree that the optimal targets for AD immunotherapy are pathological forms of Aβ and tau. The relationship between these molecules in progression of AD pathology is still controversial, with the majority of data supporting Aβ aggregation being the primary event in AD pathogenesis, secondarily triggering production of pathological tau28,29,30,31,32,33. Nonetheless, accumulation of pathological tau in the brains correlates with dementia in AD patients. Thus, by the time clinical symptoms appear, there is already substantial tau pathology in the brains34,35. Therefore, we propose that anti-Aβ immunotherapy should be initiated at the early stages of AD to minimize synaptic and neuronal loss, while anti-tau immunotherapy may be most effective when disease progression is more advanced33. Thus we have decided to generate vaccines that will target pathological molecules either sequentially (e.g. Aβ vaccinations followed by tau vaccination) or simultaneously (mixture of Aβ plus tau vaccines, or dual-epitope vaccine containing both Aβ and tau B cell epitopes). Importantly, although clinical data from anti-tau immunotherapy are not currently available, results from anti-Aβ active and passive vaccination trials suggest that only relatively high concentrations of antibodies are therapeutically potent9,30,31,32,33,36. Therefore, to enhance immune response in elderly patients with immunosenescence37 we have developed recombinant protein-based Aβ and tau, or dual-epitope vaccines by fusing relevant epitopes of these pathological proteins with our MultiTEP platform which is composed of 12 foreign Th cell epitopes, which are the promiscuous PADRE epitope, epitopes from Tetanus Toxin (P23, P32, P21, P30, P2, P7, P17 and P28), Hepatitis B (HBVnc & HBsAg), and influenza virus (MT)10. We hypothesized that this should provide a broad coverage of human MHC class II polymorphism utilizing the wide array of tetanus toxin, hepatitis B and influenza Th epitopes incorporated into the MultiTEP platform. We have previously shown that MultiTEP platform-based DNA vaccine targeting Aβ1-11 was immunogenic in mice, rabbits, and in monkeys with highly polymorphic MHC class II genes10,11,12,13. Here we further suggested that the same MultiTEP platform used for two different recombinant protein-based vaccines targeting Aβ and tau could be beneficial because Th cells activated by AV-1959R will generate strong Th memory cells and will facilitate rapid production of anti-tau antibodies in the future vaccination/s of the same organism with the anti-tau vaccine, AV-1980R. In this study we report for the first time on the immunogenicity of vaccines targeting Aβ, tau or both pathological molecules simultaneously or sequentially. It is well known that to be immunogenic any recombinant protein should be formulated in a potent adjuvant. In the AN-1792 trials a substantial portion of vaccinated subjects were non-responders, even though the strong QS21 adjuvant was used31,38. Thus, the first aim of this study was to identify an optimal adjuvant for use in future AD vaccine trials. Figures 1 and 2 clearly demonstrate that AdvaxCpG formulated with AV-1959R vaccine provided significantly higher Th cell and anti-Aβ antibody responses than any other adjuvant approved for human use or tested in clinical trials. Moreover, AdvaxCpG enhanced both Th2 and Th1 immune responses as reflected by the highest induction of not only IgG1, but also IgG2ab antibody isotype. Antibodies of the IgG2ab isotype exhibit the highest level of Fc effector function, which may provide the utmost efficiency in AD immunotherapy39, and the acute pro-inflammatory responses (IFN-γ+SFC) generated by AV-1959R formulated with AdvaxCpG could be beneficial for AD treatment as well, since TLR4 agonist MPLA reduced Aβ load in the brain of mice and enhanced cognitive function40. Finally, MultiTEP-based vaccine design is anticipated to be safe, because Th epitopes in this platform are all foreign and are not expressed in the brain. While this is the first report of AdvaxCpG being used for enhancement of the immune response against a B cell self-epitope fused with MultiTEP, the potency of this adjuvant has been previously demonstrated for vaccines targeting viral and bacterial antigens18. Importantly, a pandemic influenza vaccine formulated with Advax™ was effective in human subjects up to 90 years of age, enhancing anti-influenza plasmablast and antibody responses across the whole age spectrum24. The ability of this delta-inulin based adjuvant to help counter the normal age-related decline in plasmablast and antibody responses to influenza immunization is likely to be important for human AD vaccine development, as these will principally need to be administered to elderly subjects with immuno-senescence34. As mentioned above, the difference in the timing of Aβ and tau accumulation34 and their different roles in the onset and progression of AD, suggest that sequential vaccinations with Aβ and tau vaccines, or even combined vaccine against both molecules might represent the most effective AD approach. In particular, the same vaccine platform could be used to both prevent the onset of AD41,42,43,44, and also slow down development of tauopathy-associated dementia32,45,46,47,48,49,50,51. In order to utilize such an approach we have developed three MultiTEP platform-based vaccines targeting Aβ, tau or both molecules simultaneously. All MultiTEP-based vaccines formulated with AdvaxCpG induce strong cellular and humoral (concentrations of antibody and numbers of ASC) immune responses (Figs 4 and 5). 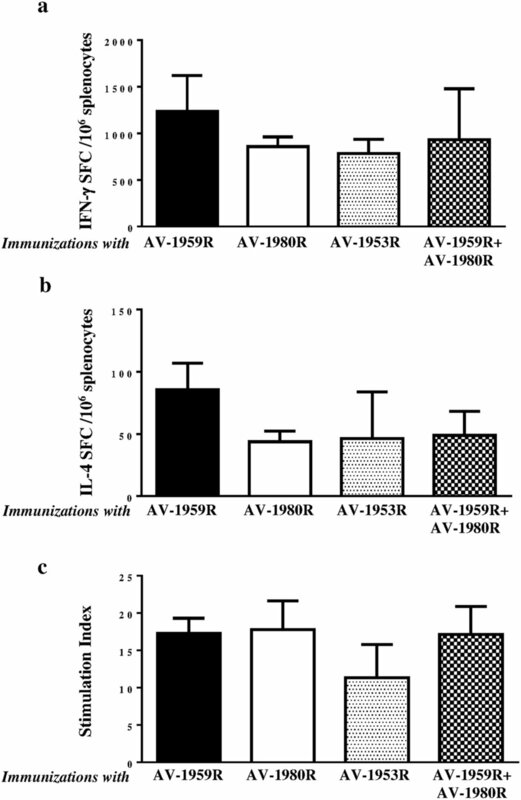 Co-immunizations with AV-1959R and AV-1980R vaccines provided high antibody titers against Aβ and tau epitopes, respectively and these humoral immune responses did not differ from results of immunization with single AV-1980R or AV-1959R vaccines. However, the AV-1953R dual vaccine demonstrated significantly decreased anti-tau humoral immune responses compared with mice immunized with AV-1980R or a mixture of AV-1980R and AV-1959R vaccines (Figs 4 and 5). These decreases in antibody titers and numbers of ASC were not associated with insufficient Th cell stimulation by AV-1953R vs AV-1980R/AV-1959R, since the Th cell responses did not differ significantly between these groups (Fig. 3). This suggested that the three copies of tau2-18 B cell epitope in the MultiTEP vaccine might not be adequately presented on the surface of the folded AV-1953R or AV-1980R protein. In the absence of crystal structures, we performed an in silico approach to create structural models of the MultiTEP-based proteins that were further optimized using molecular dynamic simulation. From the 3D in silico models of these vaccines it appears that tau2-18 epitopes may have a less optimal presentation on the surface of AV-1953R dual vaccine than on the AV-1980R single one (Fig. 6). These subtle differences in the structural configuration may have played a critical role in the observed differences in the antibody titers and ASC numbers. Another possible reason could be B cell immunodominance of the Aβ epitope which may suppress the maturation of tau-specific B cells by competition for antigen-specific Th cells. However, this was not the case when immunization was performed with a mixture of the two vaccines containing the same Th epitopes (Fig. 5). In addition, we have performed experiments with increased doses of AV-1953R and did not see an increase of anti-tau antibody concentrations too (data not shown). Regardless of the exact cause for the varying immunogenicity seen with the different MultiTEP-based tau vaccines it is clear that AV-1980R vaccine was more immunogenic than dual-epitope vaccine, AV-1953R, and therefore, it could be used for AD therapy following preventive vaccinations with AV-1959R. Mice primed by AV-1959R responded significantly better to the booster vaccination with AV-1980R (Fig. 8a,b). Importantly, regardless of the vaccine used (single, mixture or dual), the generated antibodies are potentially functional and bind equally well to the pathological deposits of Aβ and tau in the brain sections from four AD cases (Fig. 7). It is important to note, that antibodies were effectively binding oligomeric forms of Aβ and tau, which are widely believed to be much more toxic than the fibrils and plaques52. These data may open a new avenue for future vaccination regimens, as the preventive AV-1959R could be used in prodromal AD subjects and then, in case of subsequent disease progression, boosting could be performed with the AV-1980R vaccine. Hence, using AV-1959R as a preventive vaccine, and then adding AV-1980R after onset of AD may provide the broadest protection across the AD clinical disease spectra. In summary, optimal AD vaccine formulation, adjuvant selection and targeting of the right epitopes at the appropriate stage of disease will be crucial to a successful immunotherapeutic approach. An AD vaccine based on target epitopes attached to universal, highly immunogenic MultiTEP vaccine platform when combined with AdvaxCpG, a potent yet well tolerated adjuvant suitable for human use, induced extremely high antibody titers against both Aβ and tau, at levels not previously achieved in other studies. The MultiTEP strategy provides a unique opportunity to generate high antibody responses in subjects by utilizing memory Th cells previously generated in the human population in response to infection or vaccination by tetanus toxin, hepatitis B and influenza. The MultiTEP platform may be especially beneficial in the elderly because the vaccine utilizes memory T cells that are in abundance in elderly patients instead of relying on activation of naïve T cells, which decline with age. Therefore, the universal and highly immunogenic MultiTEP vaccine platform shows promise for both preventive and therapeutic approaches in AD. Female, 6–8 weeks old C57BL/6 mice (H-2b haplotype) were obtained from Jackson Laboratory. All animals were housed in a temperature and light-cycle controlled facility, and their care was under the guidelines of the NIH and an approved IACUC protocol at UC Irvine. Animal experiments were performed according to the guideline of the Animal Care and Use Committee of UCI and approved by University Laboratory Animal Resources (ULAR). To prepare three recombinant proteins, minigenes encoding 3Aβ1-11-MultiTEP, 3Tau2-18-MultiTEP or 3Aβ1-11-MultiTEP-3Tau2-18 were cloned into the modified E. coli expression vector pET11 (for AV-1959R; Novagen, MA) or pET24a (for AV-1980R and AV-1953R; Novagen, MA) in frame with 6xHis-Tag at the C-terminus. DNA sequencing was performed to confirm that the generated plasmids contained the correct sequences. Recombinant proteins were purified from E. coli BL21 (DE3) cells transformed with pET11/3Aβ1-11-MultiTEP, pET24a/3Tau2-18-MultiTEP or pET24a/3Aβ1-11-MultiTEP-3Tau2-18 plasmids as described13,53. The final recombinant protein was analyzed in 10% Bis-Tris gel electrophoresis (NuPAGE Novex Gel, Invitrogen, CA). Protein bands were visualized by Coomassie dye (Fig. S2a) and specificity of the bands was confirmed by Western Blot (WB) using 6E10 (Fig. S2b) and anti-tau2-18 1C9 (Fig. S2c) monoclonal antibodies. The level of endotoxin was measured using E-TOXATE kits, as recommended by the manufacturer (Sigma, St Louis, MO). Seven groups of C57BL/6 mice (n = 5–8) were immunized with 20 μg of AV-1959R (pET11/3Aβ1-11-MultiTEP) formulated with a selection of adjuvants: Montanide-ISA51 (s.c.; 50/50 ratio; SEPPIC, France), Montanide-ISA720 (s.c.; 50/50 ratio; SEPPIC, France), MPLA-SM (s.c.; 10 μg; Enzo, NY), Alhydrogel® (s.c.; 70 μg; BRENNTAG, Denmark), Quil-A (s.c.; 20 μg; BRENNTAG, Denmark), Advax™, and AdvaxCpG (both i.m. ; 1mg; Vaxine Pty Ltd, Adelaide, Australia). All mice were injected four times at biweekly intervals. Sera were collected 14 days after the third immunization and were used to measure anti-Aβ antibody responses. On day 7 after the last injection mice were terminated and cellular immune responses were analyzed in splenocytes. Four groups of C57BL/6 mice (n = 8 per group) were immunized with AV-1959R (20 μg/per mouse/per injection), AV-1980R (pET24a/3Tau2-18-MultiTEP, 20 μg/per mouse/per injection), AV-1953R (pET24a/3Aβ1-11-MultiTEP-3Tau2-18, 20 μg/per mouse/per injection) and mixture of AV-1959R and AV-1980R proteins (20 μg protein/mouse/injection), all formulated with AdvaxCpG adjuvant (1 mg/mouse/injection). Control groups of mice were injected with AdvaxCpG adjuvant only or PBS (n = 6 for both groups). All mice were injected four times at biweekly intervals. Sera were collected 14 days after third immunizations and anti-Aβ and anti-tau antibody responses were analyzed. On day 7 after the last injection mice were terminated and cellular immune responses were analyzed in splenocytes. We studied the effect of switching from AV-1959R to AV-1980R. Two groups of mice (n = 14) were immunized twice with AV-1959R formulated with AdvaxCpG or injected with AdvaxCpG only. Then both groups received a single vaccination with AV-1980R formulated with AdvaxCpG. Four mice from each group were terminated at day 7 after the third injection and T cell responses were measured in splenocytes. The remaining mice (n = 10 per group) were bled at day 14 after immunization for measurement of serum antibody responses. The concentrations of anti-Aβ and anti-tau antibodies in serum were determined by ELISA, as described previously11,53,54. Anti-Aβ and anti-tau antibody concentrations were calculated using a calibration curve generated with 6E10 (Covance, CA) and 1C9 mAbs (generated at the Institute for Molecular Medicine, Huntington Beach, CA), respectively. HRP-conjugated anti-mouse IgG (Jackson ImmunoResearch Laboratories, ME) was used as secondary antibody. HRP-conjugated anti-IgG1, IgG2ab, IgG2b and IgM specific antibodies (Bethyl Laboratories, Inc.) were used to characterize the isotype profiles of anti-Aβ antibodies in individual sera at different dilutions (see legend of Fig. S1). Analysis of IFN-γ and IL-4 producing T cells was performed in splenocyte cultures from immunized mice by ELISpot assay (BD Biosciences, CA), as previously described10,44,55,56. Cultures of splenocytes were re-stimulated in vitro with a cocktail of 12 peptides representing the Th epitopes in the MultiTEP vaccine10 (2 μg/ml of each peptide), soluble Aβ40, tau2-18 or irrelevant peptides at 10 μg/ml for 20 hours. The numbers of SFC per 106 splenocytes stimulated with Th peptides or Aβ40 or tau2-18, were then counted. T cell proliferation assay was performed in splenocyte cultures using a [3H]-thymidine incorporation assay, as previously described53,57. The cultures of splenocytes from mice were re-stimulated in vitro with the same antigens that were used in ELISpot assay. Stimulation index (SI) was calculated for each mouse using the formula: SI = experimental count/spontaneous count, where spontaneous count wells included irrelevant peptide. Antibody-secreting B cells (ASC) specific to Aβ and tau were detected in splenocytes by ELISpot (Mabtech Inc, Cincinnati, OH). Splenocytes from experimental and control mice were incubated for 24 hours in 96-well plates coated with Aβ42 or tau2-18 peptides. After incubation the assay was performed as recommended by the manufacturer (Mabtech Inc, Cincinnati, OH). 0.2 g of brain tissue from four different AD cases were homogenized in 0.4 ml TBS buffer with Halt™ Protease and Phosphatase Inhibitor Cocktail (100X, Thermo Scientific, CA), then centrifuged at 6400xg for 15 minutes at +4 °C. Supernatants were collected and stored at −80 °C for further analysis as soluble fractions. Remaining pellets were solubilized in 70% formic acid (FA) and centrifuged at 100,000 × g for 1 hr at +4 °C. Avoiding upper lipid layer, the lower aqueous layer was collected and stored at −70 °C for later quantification of insoluble Aβ and tau levels. Prior to the next step FA fractions were neutralized with 5N sodium hydroxide (NaOH) following a neutralization buffer (1 M TRIS Base, 0.5 M NaH2PO4) and precipitated with ice cold 10% Trichloroacetic acid (TCA) in acetone. Then precipitated fractions were resolubilized in equal volume of TBS. Protein concentration was determined using BCA Protein Assay Kit (Pierce, IL) and samples were adjusted to the equal concentration. WB with soluble and insoluble fractions of four brain homogenates were performed as described in10,44,55,56. Briefly, soluble and insoluble fractions applied to electrophoresis on NuPAGE 4–12% Bis-Tris gel in MES buffer under reducing conditions (Invitrogen, CA) and electrotransferred onto nitrocellulose membrane (GE Healthcare, NJ). For antigen retrieval, membranes with soluble fractions were boiled in PBS at 100 °C as described in Rosen et al.58 and then were blocked with 5% fat-free dry milk. Membranes with insoluble fractions were blocked without antigen retrieval. Aβ and tau were visualized by incubating with sera from mice immunized with AV-1959R, AV-1980R, AV-1953R or mixture of AV-1959R and AV-1980R followed by HRP-conjugated anti-mouse IgG (Santa Cruz Biotechnology, CA). Sera were used after normalization of antibody concentration measured by ELISA (1 μg/ml for anti-Aβ and 0.4 μg/ml for anti-tau). Sera from mice immunized with AV-1959R, AV-1980R, AV-1953R and mixture of AV-1959R and AV-1980R were screened for the ability to bind to human Aβ plaques or/and tau tangles using 40 μm brain sections of formalin-fixed cortical tissues from four different severe AD cases (received from Brain Bank and Tissue Repository, MIND, UC Irvine) using immunohistochemistry as described previously10,44,55,56. A digital camera (Olympus, Tokyo, Japan) was used to capture images of the plaques at 60× magnification. Sequences corresponding to each individual epitope within each MultiTEP protein (AV-1980R, AV-1959R AV-1953R) were submitted to the PSIPRED protein structure prediction server59 for folding profile based threading. Those template structures matching the folding pattern of the query with <=0.0001 p-value were selected (The individual templates used and the appropriate references are provided in Supplementary Tables S1–S3). Based on the multiple sequence alignment between the query and the templates, homology models were generated using the homology modeling program Modeller v9.13 60. Then each homology model was evaluated, refined and selected based on the discrete optimized protein energy score (DOPES). Then models were relaxed using the molecular dynamics simulation program NAMD v2.9 61 for 1000 steps at 310 K temperature. Finally, models of the synthetic MultiTEP proteins containing Aβ1-11 or tau2-8 epitopes and the combination were visualized using the molecular modeling program UCSF chimera62. Statistical parameters (mean, standard deviation (SD), significant difference, etc.) were calculated using the Prism 6 software (GraphPad Software, Inc., La Jolla, CA). Statistically significant differences were examined using a t-test or analysis of variance (ANOVA) and Tukey’s multiple comparisons post-test (a P value of less than 0.05 was considered significant). How to cite this article: Davtyan, H. et al. Alzheimer’s disease AdvaxCpG– adjuvanted MultiTEP-based dual and single vaccines induce high-titer antibodies against various forms of tau and Aβ pathological molecules. Sci. Rep. 6, 28912; doi: 10.1038/srep28912 (2016). 1. Selkoe, D. J. Alzheimer’s disease: a central role for amyloid. J Neuropath and Exp Neurology 53, 438–447 (1994). 2. Schenk, D., Hagen, M. & Seubert, P. Current progress in beta-amyloid immunotherapy. Curr Opin Immunol 16, 599–606 (2004). 3. Weiner, H. L. & Frenkel, D. Immunology and immunotherapy of Alzheimer’s disease. Nat Rev Immunol 6, 404–416 (2006). 4. Gerson, J. E. & Kayed, R. Formation and propagation of tau oligomeric seeds. Front Neurol 4, 93 (2013). 5. Clavaguera, F. et al. “Prion-like” templated misfolding in tauopathies. Brain Pathol 23, 342–349 (2013). 6. Yanamandra, K. et al. Anti-tau antibodies that block tau aggregate seeding in vitro markedly decrease pathology and improve cognition in vivo. Neuron 80, 402–414 (2013). 7. Frost, B. & Diamond, M. I. Prion-like mechanisms in neurodegenerative diseases. Nat Rev Neurosci 11, 155–159 (2010). 8. Ballatore, C., Lee, V. M. & Trojanowski, J. Q. Tau-mediated neurodegeneration in Alzheimer’s disease and related disorders. Nat Rev Neurosci 8, 663–672 (2007). 9. Boche, D., Denham, N., Holmes, C. & Nicoll, J. A. Neuropathology after active Abeta42 immunotherapy: implications for Alzheimer’s disease pathogenesis. Acta Neuropathol 120, 369–384 (2010). 10. Davtyan, H. et al. The MultiTEP platform-based Alzheimer’s disease epitope vaccine activates a broad repertoire of T helper cells in nonhuman primates. Alzheimers Dement 10, 271–283 (2014). 11. Davtyan, H. et al. BTX AgilePulse(TM) system is an effective electroporation device for intramuscular and intradermal delivery of DNA vaccine. Curr Gene Ther 14, 190–199 (2014). 12. Ghochikyan, A. et al. Refinement of a DNA based Alzheimer’s disease epitope vaccine in rabbits. Hum Vaccin Immunother 9, 1002–1010 (2013). 13. Evans, C. F. et al. Epitope-based DNA vaccine for Alzheimer’s disease: Translational study in macaques. Alzheimers Dement 10, 284–295 (2014). 14. Morfini, G. A. et al. Axonal transport defects in neurodegenerative diseases. J Neurosci 29, 12776–12786 (2009). 15. Ward, S. M., Himmelstein, D. S., Lancia, J. K. & Binder, L. I. Tau oligomers and tau toxicity in neurodegenerative disease. Biochem Soc Trans 40, 667–671 (2012). 16. Kanaan, N. M. et al. Phosphorylation in the amino terminus of tau prevents inhibition of anterograde axonal transport. Neurobiol Aging 33(826), e815–830 (2012). 17. Derisbourg, M. et al. Role of the Tau N-terminal region in microtubule stabilization revealed by new endogenous truncated forms. Sci Rep 5, 9659 (2015). 18. Petrovsky, N. & Cooper, P. D. Advax, a novel microcrystalline polysaccharide particle engineered from delta inulin, provides robust adjuvant potency together with tolerability and safety. Vaccine, 33, 5920–5926 (2015). 19. Honda-Okubo, Y., Saade, F. & Petrovsky, N. Advax, a polysaccharide adjuvant derived from delta inulin, provides improved influenza vaccine protection through broad-based enhancement of adaptive immune responses. Vaccine 30, 5373–5381 (2012). 20. Layton, R. C. et al. Delta inulin polysaccharide adjuvant enhances the ability of split-virion H5N1 vaccine to protect against lethal challenge in ferrets. Vaccine 29, 6242–6251 (2011). 21. Petrovsky, N. et al. An inactivated cell culture Japanese encephalitis vaccine (JE-ADVAX) formulated with delta inulin adjuvant provides robust heterologous protection against West Nile encephalitis via cross-protective memory B cells and neutralizing antibody. J Virol 87, 10324–10333 (2013). 22. Honda-Okubo, Y. et al. Severe Acute Respiratory Syndrome-Associated Coronavirus Vaccines Formulated with Delta Inulin Adjuvants Provide Enhanced Protection while Ameliorating Lung Eosinophilic Immunopathology. J Virol 89, 2995–3007 (2015). 23. Gordon, D. L. et al. Randomized clinical trial of immunogenicity and safety of a recombinant H1N1/2009 pandemic influenza vaccine containing Advax polysaccharide adjuvant. Vaccine 30, 5407–5416 (2012). 24. Li, L., Honda-Okubo, Y., Li, C., Sajkov, D. & Petrovsky, N. Delta Inulin Adjuvant Enhances Plasmablast Generation, Expression of Activation-Induced Cytidine Deaminase and B-Cell Affinity Maturation in Human Subjects Receiving Seasonal Influenza Vaccine. PLoS ONE 10, e0132003 (2015). 25. Davtyan, H. et al. Immunogenicity of DNA- and recombinant protein-based Alzheimer Disease Epitope Vaccines. Hum Vaccine Immunother 10, 1248–55 (2014). 26. McLaurin, J. et al. Therapeutically effective antibodies against amyloid-beta peptide target amyloid-beta residues 4–10 and inhibit cytotoxicity and fibrillogenesis. Nat Med 8, 1263–1269 (2002). 27. Alzheimer’s Disease International. World Alzheimer Report: The Global Impact of Dementia (2015). 28. Lobello, K., Ryan, J. M., Liu, E., Rippon, G. & Black, R. Targeting Beta amyloid: a clinical review of immunotherapeutic approaches in Alzheimer’s disease. Int J Alzheimers Dis 2012, 628070 (2012). 29. Bloom, G. S. Amyloid-beta and tau: the trigger and bullet in Alzheimer disease pathogenesis. JAMA Neurol 71, 505–508 (2014). 30. Golde, T. E. Open questions for Alzheimer’s disease immunotherapy. Alzheimers Res Ther 6, 3 (2014). 31. Wisniewski, T. & Goni, F. Immunotherapeutic approaches for Alzheimer’s disease. Neuron 85, 1162–1176 (2015). 32. Pedersen, J. T. & Sigurdsson, E. M. Tau immunotherapy for Alzheimer’s disease. Trends Mol Med 21, 394–402 (2015). 33. Agadjanyan, M. G., Petrovsky, N. & Ghochikyan, A. A fresh perspective from immunologists and vaccine researchers: Active vaccination strategies to prevent and reverse Alzheimer’s disease. Alzheimers Dement 11, 1246–1259 (2015). 34. Jack, C. R. Jr. et al. Tracking pathophysiological processes in Alzheimer’s disease: an updated hypothetical model of dynamic biomarkers. Lancet Neurol 12, 207–216 (2013). 35. Bateman, R. J. et al. Clinical and biomarker changes in dominantly inherited Alzheimer’s disease. N Engl J Med 367, 795–804 (2012). 36. Hang, Y. et al. Pharmacokinetic and Pharmacodynamic (PK/PD) assessment and covariate analysis of BIIB037 in a randomized, double-blind, placebo-controlled, phase 1B study in patients with prodromal or mild alzheimer’s disease. Neurodegener Dis 15 Suppl1, 800 (2015). 37. Goronzy, J. J. & Weyand, C. M. Understanding immunosenescence to improve responses to vaccines. Nat Immunol 14, 428–436 (2013). 38. Vellas, B. et al. Long-term follow-up of patients immunized with AN1792: reduced functional decline in antibody responders. Curt Alzheimer Res 6, 144–151 (2009). 39. Bard, F. et al. Epitope and isotype specificities of antibodies to beta -amyloid peptide for protection against Alzheimer’s disease-like neuropathology. Proc Natl Acad Sci USA 100, 2023–2028. (2003). 40. Michaud, J. P. et al. Toll-like receptor 4 stimulation with the detoxified ligand monophosphoryl lipid A improves Alzheimer’s disease-related pathology. Proc Natl Acad Sci USA 110, 1941–1946 (2013). 41. Liu, B. et al. MER5101, a Novel Abeta1-15:DT Conjugate Vaccine, Generates a Robust Anti-Abeta Antibody Response and Attenuates Abeta Pathology and Cognitive Deficits in APPswe/PS1DeltaE9 Transgenic Mice. J Neurosci 33, 7027–7037 (2013). 42. Lemere, C. A. & Masliah, E. Can Alzheimer disease be prevented by amyloid-beta immunotherapy? Nat Rev Neurol 6, 108–119 (2010). 43. Delrieu, J., Ousset, P. J., Caillaud, C. & Vellas, B. ‘Clinical trials in Alzheimer’s disease’: immunotherapy approaches. J Neurochem 120 Suppl1, 186–193 (2012). 44. Petrushina, I. et al. 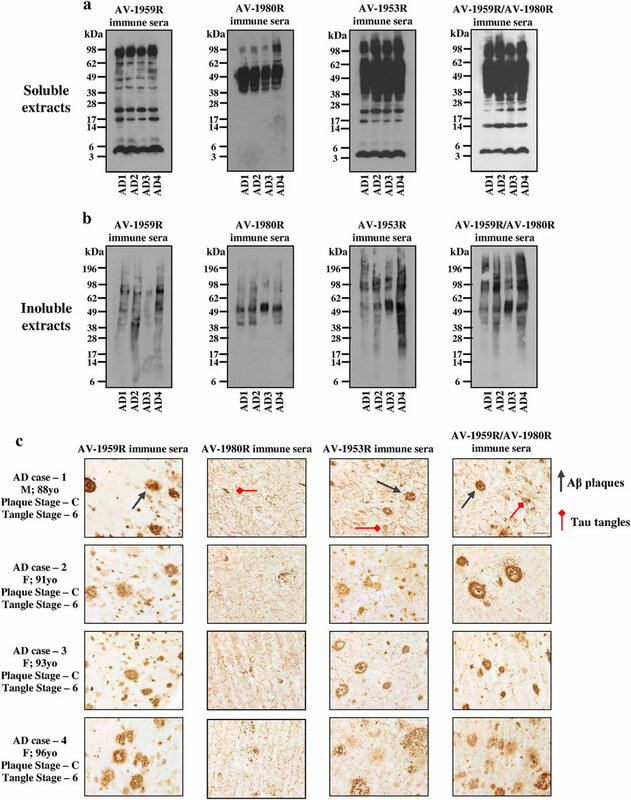 Alzheimer’s Disease Peptide Epitope Vaccine Reduces Insoluble But Not Soluble/Oligomeric Aβ Species in Amyloid Precursor Protein Transgenic Mice. J Neurosci 27, 12721–12731 (2007). 45. Sigurdsson, E. M. Immunotherapy targeting pathological tau protein in Alzheimer’s disease and related tauopathies. J Alzheimers Dis 15, 157–168 (2008). 46. Holmes, B. B. & Diamond, M. I. Prion-like properties of Tau protein: the importance of extracellular Tau as a therapeutic target. J Biol Chem 289, 19855–19861 (2014). 47. Yanamandra, K. et al. Anti-tau antibody reduces insoluble tau and decreases brain atrophy. Ann Clin Transl Neurol 2, 278–288 (2015). 48. Castillo-Carranza, D. L. et al. Tau immunotherapy modulates both pathological tau and upstream amyloid pathology in an Alzheimer’s disease mouse model. J Neurosci 35, 4857–4868 (2015). 49. Yang, C. & Xiao, S. New developments of clinical trial in immunotherapy for Alzheimer’s disease. Curr Pharm Biotechnol 16, 484–491 (2015). 50. Sigurdsson, E. M. Tau immunotherapy and imaging. Neurodegener Dis 13, 103–106 (2014). 51. Sankaranarayanan, S. et al. Passive immunization with phospho-tau antibodies reduces tau pathology and functional deficits in two distinct mouse tauopathy models. PLoS One 10, e0125614 (2015). 52. Haass, C. & Selkoe, D. J. Soluble protein oligomers in neurodegeneration: lessons from the Alzheimer’s amyloid beta-peptide. Nat Rev Mol Cell Biol 8, 101–112 (2007). 53. Davtyan, H. et al. DNA prime-protein boost increased the titer, avidity and persistence of anti-Abeta antibodies in wild-type mice. Gene Ther 17, 261–271 (2010). 54. Movsesyan, N. et al. Reducing AD-like pathology in 3xTg-AD mouse model by DNA epitope vaccine- a novel immunotherapeutic strategy. PLos ONE 3, e21–24 (2008). 55. Cribbs, D. H. et al. Adjuvant-dependent modulation of Th1 and Th2 responses to immunization with beta-amyloid. Int. Immune. 15, 505–514 (2003). 56. Davtyan, H. et al. Immunogenicity, Efficacy, Safety, and Mechanism of Action of Epitope Vaccine (Lu AF20513) for Alzheimer’s Disease: Prelude to a Clinical Trial. J Neurosci 33, 4923–4934 (2013). 57. Agadjanyan, M. G. et al. Prototype Alzheimer’s disease vaccine using the immunodominant B cell epitope from beta-amyloid and promiscuous T cell epitope pan HLA DR-binding peptide. J Immunol 174, 1580–1586 (2005). 58. Rosen, R. F., Tomidokoro, Y., Ghiso, J. A. & Walker, L. C. SDS-PAGE/immunoblot detection of Abeta multimers in human cortical tissue homogenates using antigen-epitope retrieval. J Vis Exp 38, 1916 (2010). 59. McGuffin, L. J., Bryson, K. & Jones, D. T. The PSIPRED protein structure prediction server. Bioinformatics 16, 404–405 (2000). 60. Fiser, A. & Sali, A. Modeller: generation and refinement of homology-based protein structure models. Methods Enzymol 374, 461–491 (2003). 61. Phillips, J. C. et al. Scalable molecular dynamics with NAMD. J Comput Chem 26, 1781–1802 (2005). 62. Pettersen, E. F. et al. UCSF Chimera–a visualization system for exploratory research and analysis. J Comput Chem 25, 1605–1612 (2004). This work was supported by funding from NIH (R01-NS050895, R01-AG020241 and U01-AG048310) and Alzheimer’s Association (IIRG-12-239626 and NIRG-13-281227). The Aβ42 peptide was provided by the University of California Alzheimer’s Disease Research Center (UCI-ADRC), which is funded by NIH/NIA Grant P50 AG16573. Development of AdvaxCpG adjuvant was supported by funding from NIAID/NIH (Contract No. HHS-N272201400053C, HHS-N272200800039C and U01-AI061142). The content is solely the responsibility of the authors and does not necessarily represent the official views of the NIH. H.D. and K.Z. contributed substantially to the design of the study. H.D. performed the immunizations of mice and carried out immunoassays. K.Z. participated in preparation and purification of proteins and helped H.R. in silico modeling of constructs. Both first authors (H.D. and K.Z.) drafted the manuscript. H.R. was responsible for all in silico modeling of constructs and interpretation of results. A.H. participated in immunization of mice and helped in ELISA. A.D. participated in immunization of mice and helped to perform Th cell responses. I.P. was responsible for design and carrying out IHC studies. K.K. was responsible for homogenization of A.D. brains. D.H.C. participated in design of studies and interpretation of data. N.P. provided Advax adjuvants and helped troubleshoot difficulties connected with immunological studies, was instrumental in interpretation of all three 3D models of MultiTEP-based vaccines and helped draft the manuscript, revised it critically for important intellectual content. M.G.A. and A.G. designed studies, mentored primary authors, regularly analyzed all data with first authors, conceived the study, and made conclusions. They prepared final version of the manuscript and gave it to all authors. All authors have read and approved the final manuscript for publication. N.P. is a Director and H.R. an employee of Vaxine Pty Ltd, the developer of the Advax adjuvant technology. M.G.A. is co-founder of Neuroimmune that licensed MultiTEP vaccine platform technology from the Institute for Molecular Medicine. The remaining author(s) declare no financial and commercial conflict of interests. Correspondence to Michael G. Agadjanyan or Anahit Ghochikyan.